InnovFest unBound as a whole has only a few touch points with the usual AdAsia topics. Co-chaired by Yossi Vardi and Lily Chan, the event is a powerful showcase for the Singapore Smart Nation programme. So going around the event you will see a wide variety of start-ups ranging from ultra small to corporate embedded and addressing all sorts of areas, ranging from health care via marketing to finance and from mathematics to creativity. The participants had to pitch to an audience as well as to over 100 Unilever executives. 7 finalists entered the final on the second and last day of InnovFest unBound. These finalists are all providing solutions and tools for the field of marketing, social media monitoring, e-commerce and communication. NextUser, a marketing tool that unifies data across silos in a company and helps marketers gaining insights through artificial intelligence, took 1st place and received a cash price of 5,000 SGD, handed over by Barbara Guerpillon, Manager of the Unilever Foundry in South East Asia. 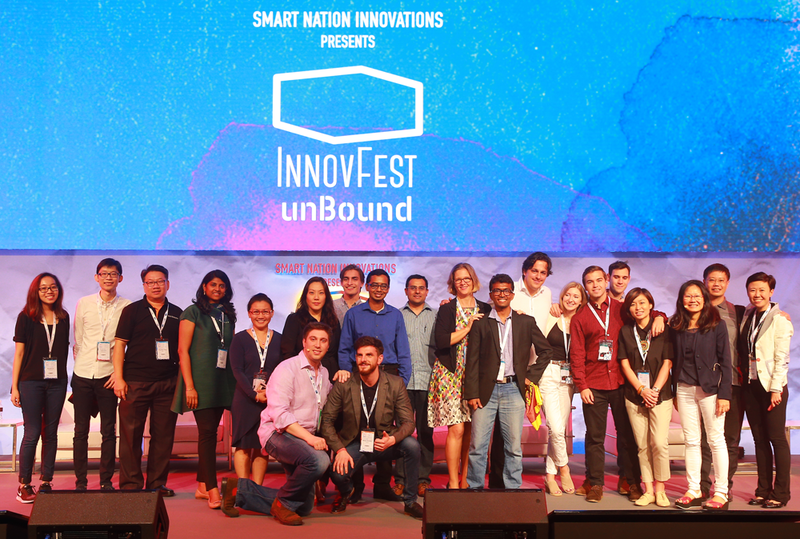 Barbara Guerpillon (middle) with Unilever Start-up Battle finalists at InnovFest unBound. Some of these startups are already quite well funded and I would even say established. LiveRoom and Near belong to this category in my opinion. NextUser comes across as surprisingly mature and they have a few big corporate names among their clients. They partner with e.g. IBM Watson to generate insights. I am sure we’ll be hearing more from them.